A must-see place for fine art and music lovers! Check out the galleries and art studios or come for one of several music events in the summer time (Jazz, classical, etc.). Grožnjan is definitely worth visiting! 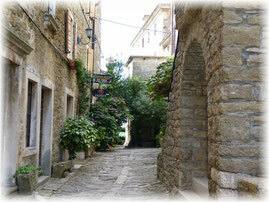 This medieval fort town was built on a steep isolated hill at an elevation of 277m. It is still surrounded by its old town wall. 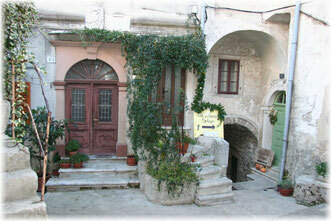 To get to the historic center, leave your car at the parking lot on the edge of town and hike up the rest of the way. 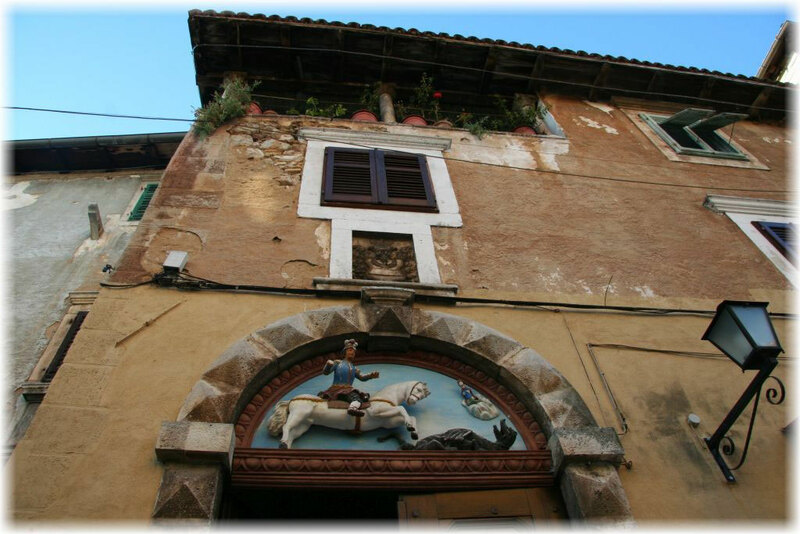 As you walk the narrow alleys leading up to the town center you will pass imposing Venetian houses. 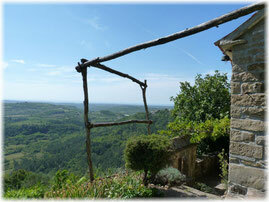 Once at the top, you’ll have an incredible view of the surrounding olive groves and vineyards. Motuvun is also famous for truffles! The unique soil composition and moisture of the forests around Motuvun provide optimal growing conditions for these highly prized, underground mushrooms. Enjoy this Motuvun specialty in many variations at the local restaurants. 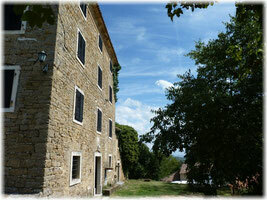 Definitely include a visit to Motuvun on your Istria tour! 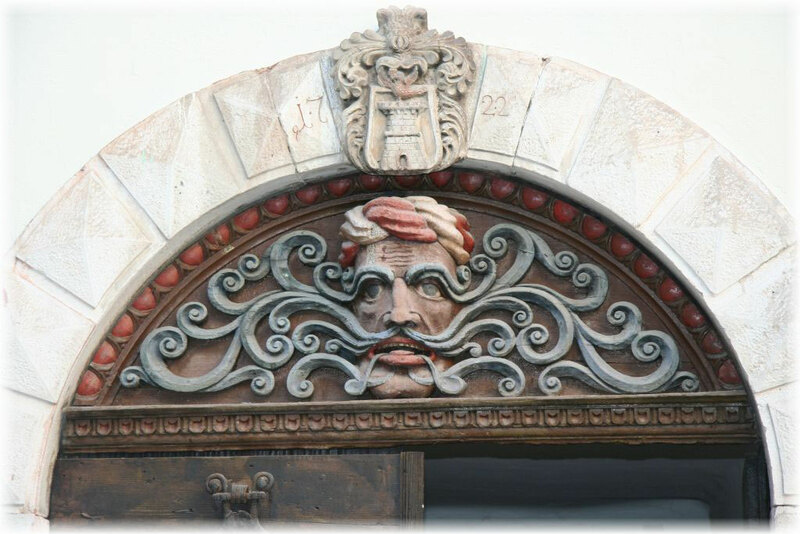 Every time we visit Rovinj, a small town on the western coast of Istria from the 7th century, we discover something new. We love wandering through the narrow and windy alleys that show off the town’s rich architectural diversity (Renaissance, Baroque, Neoclassicism). And, because the town is located on a premonitory jutting out into the sea, the view of the surrounding islands is fantastic! 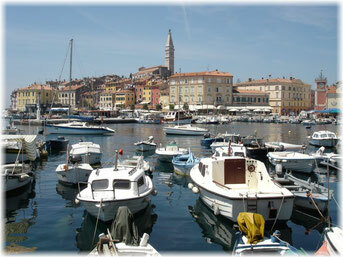 Check out Google images of Rovinj! An outstanding place for eating out! Volosko offers both upscale and more down-to-earth dining experiences. You can find high-end gourmet restaurants with world-class ratings, as well as traditional restaurants that serve simple fish dishes and other local specialties. 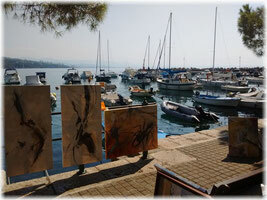 Volosko is also known for its annual fine arts competition, the “Mandrac”. It takes place at the town’s small marina (locally known as "Mandrac") on a weekend in September. Day one is set aside for the children's art competition (ages 5-14); the adult competition, split into a professional and an amateur category, takes place on day two. 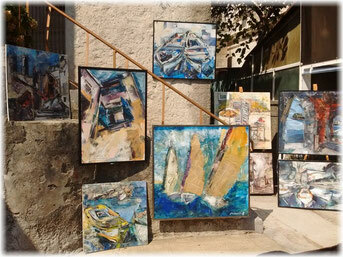 Participants exhibit their paintings in the streets around the town center and on the stairs leading down to the marina. 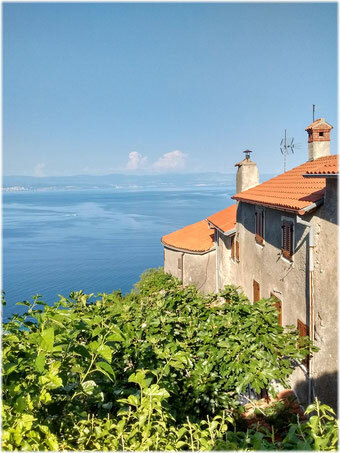 You can easily walk to Volosko from Opatija. 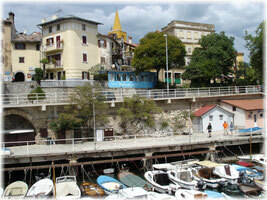 Along the promenade, it is only a 3-kilometer stroll in the direction of Rijeka. If you walk along the promenade in the opposite direction toward Lovran, you will pass numerous imposing villas from the days of the Danube Monarchy. Windy, arched alleys weave through the historic center of Lovran and present structures of several different time periods. These include the church Sveti Juraj (15th century) and the Romanesque bell tower (12th century). 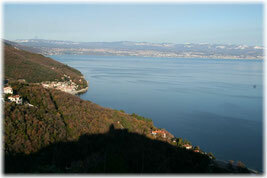 Kastav is located on an isolated hill about 6 km to the north of Opatija. While there are numerous historical structures to see, Kastav is primarily known for its cultural events. The summer fair and the guitar festival draw thousands of Croatian and international visitors each year. 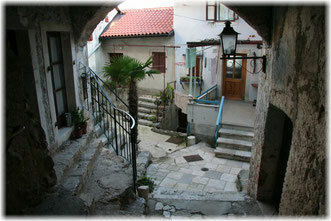 Moscenice is situated on a high plateau overlooking the main coastal road and the town of Moscenicka Draga. 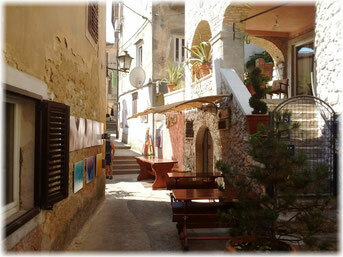 The windy alleys of this old mountain town are as charming and dreamy as any. A small museum showcasing an old olive press is definitely worth seeing. 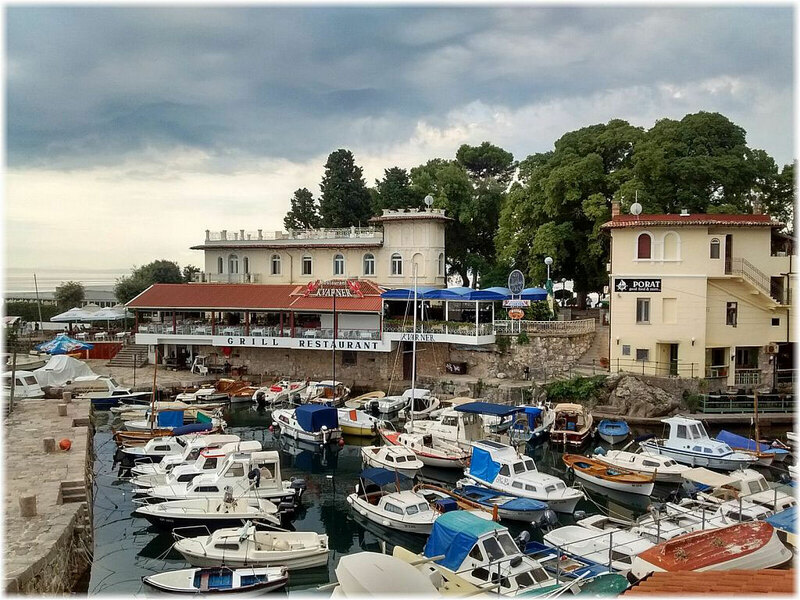 From the outdoor patio of the town restaurant you have a great view of Kvarner Bay and the islands Krk and Cres.